OAK RIDGE, TN — The Y-12 National Security Complex is helping to open doors and close the gender gap in engineering fields. Recently, Y-12 hosted its eighth annual Introduce a Girl to Engineering (IGTE) at the site’s New Hope Center. The one-day event, held in conjunction with Engineers Week, gave young female students an opportunity to discover and explore science, technology, engineering and math (or STEM) careers alongside Y-12 and Uranium Processing Facility Project scientists and engineers. More than 300 middle- and high-school students from seven area counties attended this year’s event. 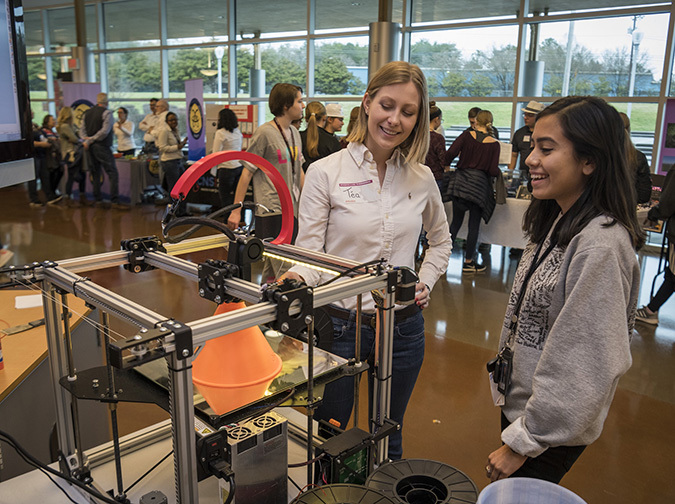 About 100 engineers, scientists and other volunteers — most from Y-12, the Uranium Processing Facility Project, and the Oak Ridge chapter of Women in Nuclear — supported the event, which encouraged students to connect their math and science skills to careers in STEM fields. For Lesly, an Oak Ridge High School senior, this was her second consecutive year attending IGTE. Last year she said she learned what engineering is about through hands-on STEM activities and by talking with female engineers. She said she returned this year determined to glean more about the varied engineering disciplines. In 2018, women comprised 15.9 percent of employed architects and engineers, according to the U.S. Bureau of Labor Statistics. Consolidated Nuclear Security, LLC, managing and operating contractor at Y 12, encourages young people to develop workforce skills the site will need in the future. Recruitment and retention of female engineers remains an important focus. For more information on each site, visit www.pantex.energy.gov or www.y12.doe.gov.